Gaza, September 20, 2009 (Pal Telegraph)-The "Youth…. 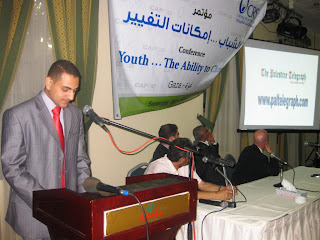 the Ability to Change" Conference has been held in Gaza City 17/9/2009. It mainly shed light on the ability of young people to create changes even in very harsh conditions. On September 17, 2009 I participated in a conference called "Youth…. the Ability to Change", which was organized by the Catholic Relief Services – CRS - in GazaCity. The conference has very clearly stressed the role of young people in making changes in any society. Most of the participants also were from young people who spoke about their own experience to the audience. Mr. Jung Geng, director of operations for the UN Relief and Works Agency for Palestine Refugees, UNRWA, spoke impressively about the crucial role that the Palestinian youth is playing in these rough conditions. He added that young people are the means of any change in any society as they are the most dynamic and vigorous group in the society. He expressed his belief that the youth of Gaza would be able to defend its legal condition, to get justice and to break the unlawful siege imposed on 1.5 million people. “The Palestinian people are being supported internationally - they are no alone", Mr. June ended his speech. "No one can deny the role of young people in any society and they are the tools of development and of creating a change" - by this sentence I started my own speech. I then talked about three main initiatives that have been organized by group of young activists. Those people who believe in their just cause have the ability to make a difference. These three initiatives have appeared as a result of the ongoing drastic siege in order to shed light on the suffering of the Palestinian people in Gaza. I first talked about my own experience about my blog and how I have developed it day by day. The story of my first blog "Black Rain on Gaza" apparently impressed the audience strongly. My goal in this Blog is to bring the reality of what is going on the ground in Gaza to people who are eager to listen. Young people, women, old men, children… - everyone is suffering day by day. People around the world should know the day-to-day reality of our people here in Gaza. Therefore, the personal stories I regularly write show these sufferings and shed light on the ongoing crisis in Gaza. Then I mentioned the well-known Gaza Concert that took place on November 27, 2008 in Gaza City. This concert was organized and supervised by group of young people who aspired to show the World the real face of the Gaza Strip. This concert is considered as a significant event of non-violent resistance. Finally I talked about the first online newspaper, The Palestine Telegraph. The first English newspaper that tries to show the international community the reality of the daily suffering all over Palestine.